Ok. I know. 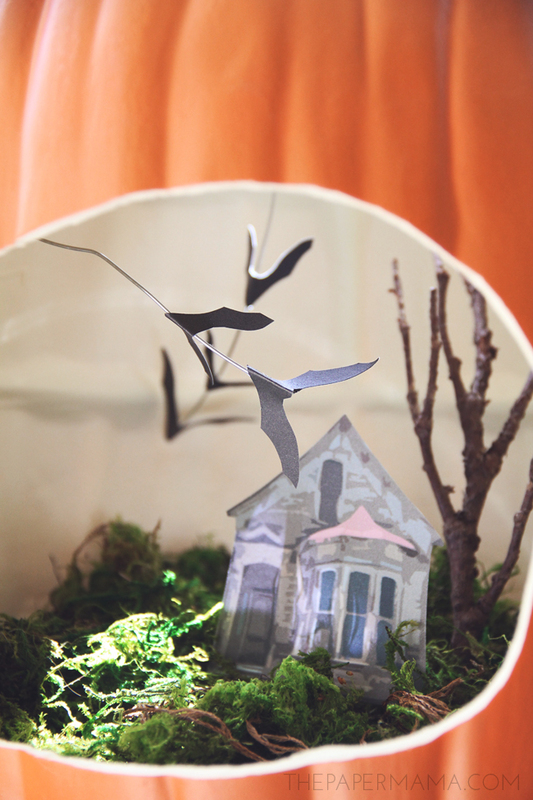 It’s not even September and I’m sharing a Halloween DIY. I swear: there will not be any other mention of Halloween until the end of September (promise). Buuut, Michaels sent me some foam pumpkins and I got inspired. So yeah. Hello Halloween DIY. Ha! 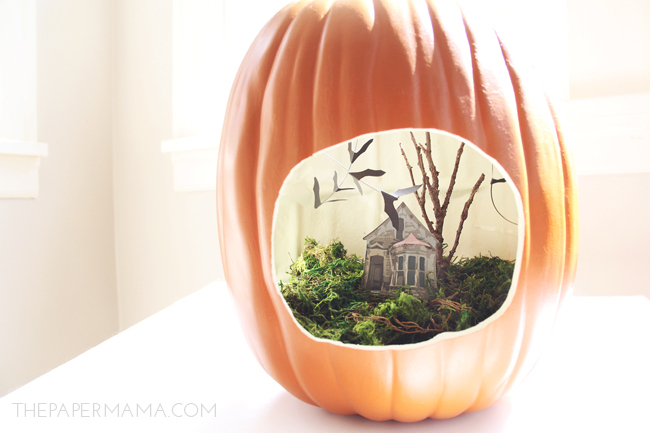 I created a Spooky Halloween Terrarium with this pumpkin. Comes with a little spooky home and crazy/wild bats. It’s intense. Perfect for Halloween 2013. – Use an X-acto knife to cut a hole out of the front of your pumpkin. I cut about an 8 inch hole (I freehand cut, but you could use a pencil to mark out the hole before cutting). 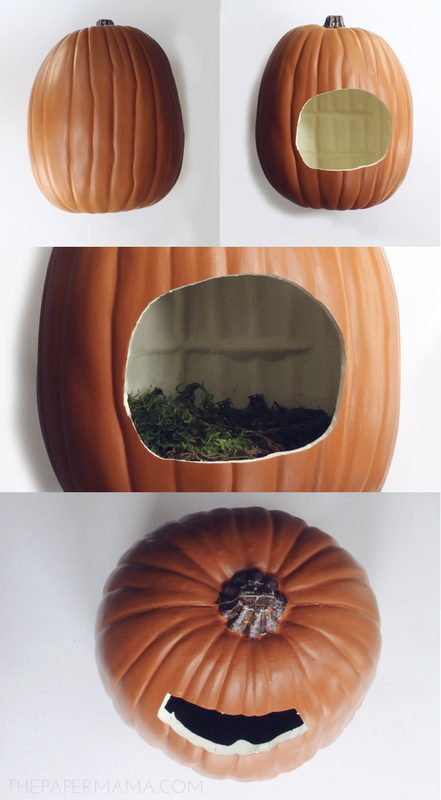 – Optional: to get a bit more light into your pumpkin, cut a small section in the back (I cut the hole so it was not visible when looking through the front hole). I did this because the pumpkin is flammable and I didn’t really want to put any sort of heat source in or around it. – Place a small piece of green floral foam in the bottom of your pumpkin. – Put a layer of moss at the bottom (over the green floral foam) for the “ground cover”. 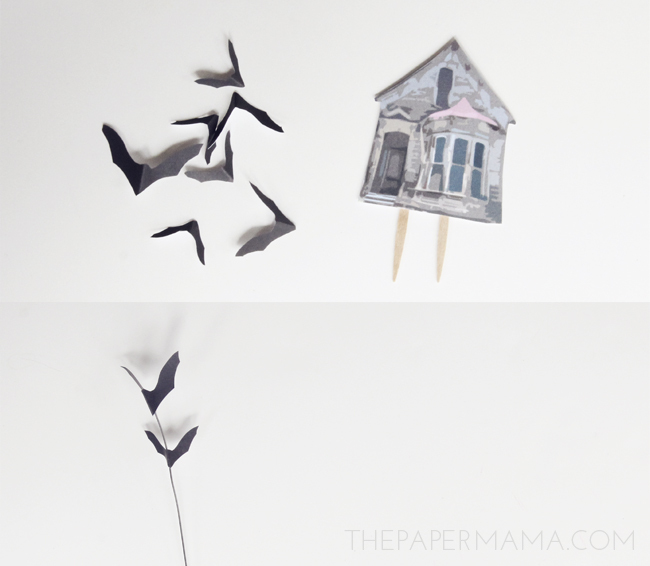 – Cut out a spooky house from my printable. Hot glue a couple of toothpicks to the back of the home. Push the home/toothpicks into the green floral foam. – Press your branch into the green foam, behind the tree. 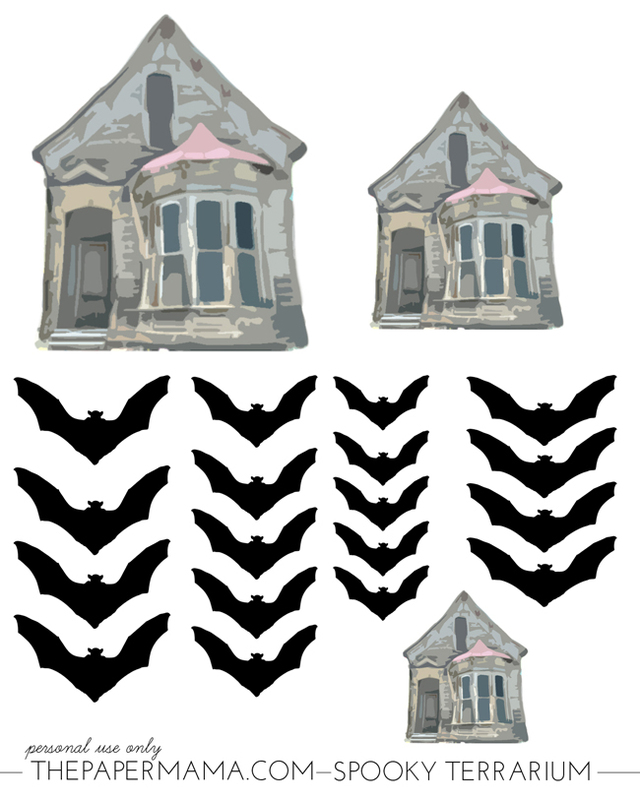 – Cut out a few of my bats from the printable (don’t worry about cutting these out perfectly, I didn’t). Gently fold the bat in half (so they look like they’re flying). – Cut out a couple bits of wire and hot glue the bats onto these wires. 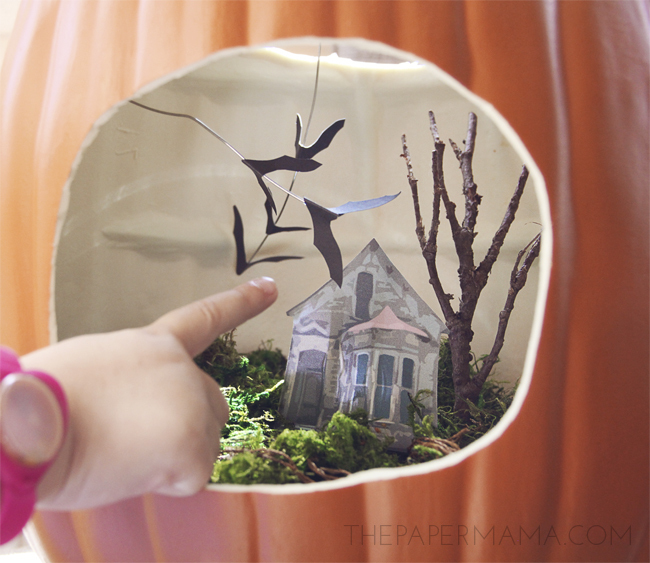 – Arrange the wired bats around the interior of the pumpkin. You can push the wire INTO the foam part of the pumpkin, or have them flying up from the “grass” by pressing the wire into the green floral foam. Enjoy! Side note: you can place this pumpkin near a lamp to get a wee bit of light into the back for a creepy nighttime glow. Just remember, pumpkin flammable. P.S. these pumpkins were sent to me, free of charge, from Michaels. wow this is a really amazing and creative idea! I’m sooo going to try this this year! What a lovely and creative idea! And, even better, you can use it again next year! Thanks for sharing! Oh, I absolutely love thins and what a clever idea. I use and always have several on hand of those battery operated lights just for fun projects like this. Oooo! I love that idea. 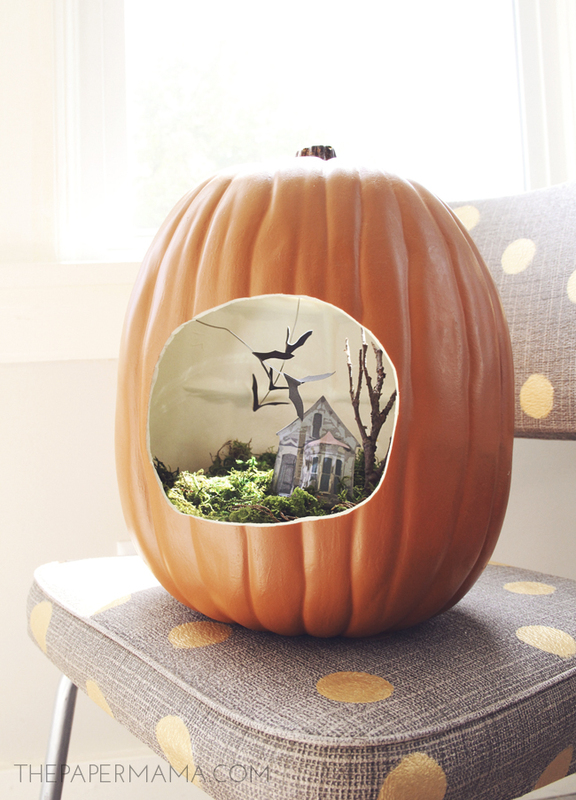 This would be especially cool if you cut out the upper window of the house with your X-acto knife. Spooky light in the attic! Did you really? I love it. I LOVE this, seriously, it's fantastic! Just so you know, I shared this post in my Weekly Round-Up Post this week! Love it! Bring on Halloween for me! This is so so lovely I want it to be Halloween right now. But hey…I still have a Christmas terrarium so I can totally do this right now too! This is so cute even though I don't want to think about Halloween yet..still in summer mode for another week……… I'm pinning it! Ok, I'm ready to think about this now. Off to Michael's! Thanks for the printable, my dear! I think I have everything else BUT the pumpkin! This is genius, I think I'm going to make this for with my son for Halloween. It's his (and mine!) favorite holiday. this is seriously the cutest pumpkin i have ever seen!! i LOVE it.